Looks like quite a cool piece of technology, right? I'd certainly say so. I was even tempted to sign up with them, partly for the "geek toy" factor but also because their interest rates are very competitive. Then Cam pointed out this nasty little gem: Our website has been built for Internet Explorer version 5 and higher. I was very disappointed to see that you only list Microsoft Internet Explorer as a supported browser. As a user of FreeBSD I do not have any chance of installing or using IE, so a site that is not browser-agnostic is of little use to me. Also, with IE's very bad rap in the security department it's extremely disturbing to see that a company that seems to be highly focused on security doesn't advise (or encourage) users to make use of any of the excellent alternatives such as Firefox or Opera. It will be interesting to see what, if any, response I garner. Are they thinking at all? Last year, I blogged this, suggesting that Telecom's board really aren't doing a very good job of acting in the best interests of their shareholders. Today, we are treated to this and this, which both add up to rather ominous tidings for the Evil Empire. The first link, Computerworld, gives some indication of the degree of institutional arrogance within the company. Their "take it or leave it" attitude, coupled with a product that will wholesale with wafer-thin margins, suggests that they expect the rest of the industry to cave in order to avoid losing customers in bulk as people flock to Xtra because it's faster than anything their ISP can offer. The second link says that, finally, we have a Prime Minister with the attitude toward Telecom that has for so long been absent from Premier House. There's no doubt that Uncle Helen has the balls to take on Theresa, the issue is whether she will dare to take the flak from the political right that will inevitably come from what can only be a strike against the property rights of a major traded corporation. With this kind of writing on the wall, my earlier post seems almost prophetic. A friend messaged me on MSN this afternoon, and said "If I owned any Telecom shares, I'd be selling them right now." At the point where people start to consider divesting themselves of stock for reasons related to impending doom, a board has failed in its duty. It's horribly tempting to buy the minimum parcel of shares required to attain voting rights, and then commence a campaign against Telecom's board to seek the drastic strategic change in direction that is required to avert wholesale slaughter at the hands of a maddened Government. Warning: Video clip is not dialup-friendly. Disclaimer: No responsibility accepted for you spraying food and/or drink on your monitor! 83% for a Philosophy test, and 100% for an InfoSys test on Excel. And I'm embarassed by it. For some inexplicable reason, I'm ashamed to be getting high(ish) marks. Why can't I just be proud of what I've achieved? Maybe it's because I'm the obnoxious, noisy guy in the class? The one who's answering the questions when nobody else wants to speak, and who's not yet managed to make it through an IS lecture without contributing something to expand upon the material being covered by the lecturer. Or maybe it's a hang over from high school, when being a stand-out intellect was a source of ridicule, so self-depreciation was a protective mechanism? And you thought your parking was problematic? 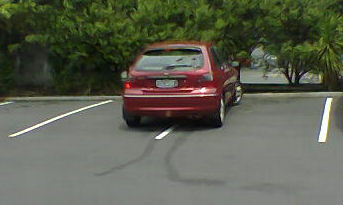 This parking was witnessed, by myself, in the carpark of Burger King on the corner of Campbell Crescent and Manukau Rd, Epsom. It had to be seen to be believed. Yes, the car did move between shots.